Edward Copeland's Tangents: With the exposition out of the way, will a story be starting soon? With the exposition out of the way, will a story be starting soon? I didn't think it was possible for a movie that's 1 hour and 50 minutes long (including end credits and requisite Marvel teaser scene) to end up spending all but about the last half-hour of that time on exposition, but indeed that's what Thor plays like. As the comic book empire continues to expand its movie franchises for an inevitable film that brings the Marvel characters together under the leadership of that mysterious SHIELD organization which allows Samuel L. Jackson to earn a living by making cameos while Clark Gregg wears suits and travels from film to film so he can report to Jackson's Nick Fury. (Have no fear — there's the required Stan Lee cameo as well.) When they toss Robert Downey Jr. in as a reformed arms maker in Iron Man and Iron Man 2, it turns out to be great fun. With Thor, you literally get an hour and 20 minutes of gobbledy-gook followed by about 25 minutes of yawn-inducing action and it's over. Kenneth Branagh directs. Yes, that Kenneth Branagh. The man once spoken of being the next Olivier in terms of bringing Shakespeare to film but he can't even be the new Olivier on an entertaining level of whoredom. His acting for cash is sporadic and not hammy enough to be a hoot and his non-Shakespeare direction results in films such as a remake of Sleuth that no one was asking for and the godawful Mary Shelley's Frankenstein where both he and Robert De Niro were so over-the-top that it turned out that John Cleese gave the film's best performance. He even marred his Shakespeare films with stunt casting that probably made the Bard in the afterlife wish the stories were true that he weren't the true author of his works. Fortunately, Anthony Hopkins is on hand to pick up some of that U.K. actor "I'll blow anyone for cash" spirit to his role as Odin, Thor's father, the king of Asgard, the realm from which Thor (Chris Hemsworth) comes. Not that Hopkins gets much emoting to do: His job — other than making certain the check clears — consists of little more than standing (and lying) around in a fancy metallic-looking suit with a patch on his eye and seriously imparting information to both the audience and to his sons, Thor and Loki (Tom Hiddleston). Thor tends to be a bit of an arrogant hothead and when a group of Asgard's enemies (I'd look up their names if I truly gave a damn, but I don't. They're sort of blue and icy) somehow invade their realm and violate a sacred area with sacred relics, Thor leads an unsanctioned raid on them which Odin did not approve. 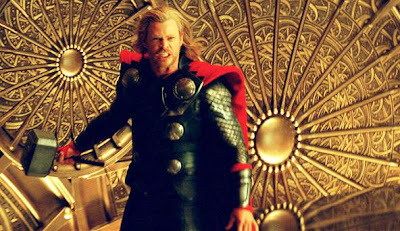 As a result, his father banishes Thor to Earth for his actions and, because all the exposition hasn't been revealed yet, decides this is the best possible time to let Loki know that he was adopted (though stolen seems a more accurate description) from the same realm and while he doesn't look blue and icy, he belongs to that enemy's race. Loki, now next in line to be king anyway since Thor has been jettisoned, in a fit of spite, plots a coup and throws Odin into a coma. Though it will be next to impossible, don't blink or you'll miss that Rene Russo plays Odin's wife Frigga, which as far as I know is not Norse for friggin' as in "give me a friggin' break." 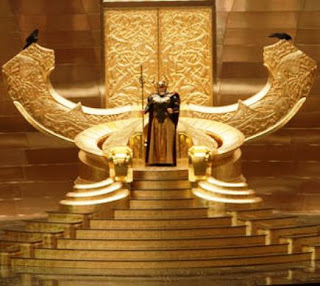 Poor Idris Elba, who has been good in so many things but most memorably as Stringer Bell in the first three seasons of The Wire, gets hidden by an elaborate costume as Asgard's gatekeeper who controls "the bridge" between different realms. In fact, the costumes and design of Asgard really offer the only good things about Thor. Those parts are gorgeous to gaze upon. Bo Welch's production design and Alexandra Byrne's costumes on Asgard do leave quite an impression even if the film itself doesn't. In theaters, the film, which was shot regularly, was converted to 3-D for some showings and I can't imagine how exciting exposition plays in three dimensions. Wow — Thor and Jane lie by a campfire and point to a paper so he can show her where he comes from. It's like I'm in the scene! Their "romance" has about as much believability as the little kids' attachment to Frosty the Snowman when they've known him for about 15 minutes. As the credits roll, before we get the requisite teaser scene with Nick Fury and the next Marvel movie, words tell us that Thor will return in The Avengers. I imagine that movie will at least have a story and, if nothing else, the IMDb cast list promises Robert Downey Jr. as Tony Stark, so that at least holds the promise of some entertainment. Speaking of Branagh, did you ever see the BBC series shot in Sweden, Wallander? I go for the Scandinavian thrillers, so I was predisposed to like it, but I was also shocked (shocked!) at how good Branagh was as the lead. It was the most unselfconscious I think I've ever seen him on film.